A typical measurement system includes an oscilloscope and an oscilloscope probe that provides the connection between the device under test (DUT) and the oscilloscope. Probe selection is critical because probe performance can be the limiting factor in the measurement system. The ideal probe would deliver the true differential signal from the DUT without changing the signal. However, conventional differential probes often fail to provide a good representation of the actual signal due to limitations in their common mode rejection ratio, derating over frequency, frequency response, and the probe’s long input leads. These limitations are even more pronounced when testing on power devices with fast switching rates and even nominal common mode voltage. This article will examine these sources of measurement error and look at how an isolated solution such as the Tektronix IsoVu measurement system can overcome these limitations. It’s a common misconception that a differential probe is floating, but the fact is traditional differential probes are based on differential amplifiers that are connected to earth ground. This ground connection limits the common mode voltage range, causes the common mode voltage frequency derating, creates ground loops, and limits common mode rejection. An ideal differential probe would be galvanically isolated from earth ground which eliminates these effects. The IsoVu measurement system represents a break from traditional architecture and obtains complete galvanic isolation through its fiber optic connection. Common mode rejection ratio (CMRR) specifies a differential probe’s ability to reject any signal that is common to both test points in a differential measurement. In a perfect world, a probe’s CMRR would be infinite. However, traditional differential probes are fundamentally limited because it’s impossible to perfectly match the two inputs to each other. In practice, a CMRR of at least 80 dB (10,000:1) will result in usable measurements. Most differential probes can easily obtain a CMRR of 80 dB or higher at DC and low frequencies where it’s possible to tune the components accurately. As the frequency of the measurement increases, a differential probe’s CMRR degrades because the mismatches become increasingly difficult to control. At 100 MHz, the CMRR capability of most measurement systems is 20 dB or less. Consider a simplified half bridge topology shown in Figure 1. Making accurate measurements at the high-side transistor can be problematic due to the combination of the component’s turn-on/turn-off times and the common mode voltage. As shown in this illustration, the common mode voltage at the gate and source is 40 V and the gate-source voltage is 5 V. When making this measurement, a specification you should be aware of is not the component’s switching frequency but its edge rates which are typically much faster. Figure 1 • Example half-bridge circuit. 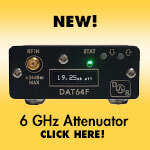 For example, a switcher with 100 kHz bandwidth can have an edge rate of 5 ns or less. These signals often include frequency components that are hundreds of megahertz due to parasitics and resonances. Most measurement systems capable of the bandwidth and common mode voltage requirements needed for the circuit in Figure 1 would only offer a CMRR of approximately 20 dB or 10:1 for a 5 ns transition. A 10:1 CMRR value would permit 4 V of blow-through due to the common mode error. Clearly, a measurement system with 4 V of common mode error is not capable of making an accurate measurement of a 5 V differential signal. Given that power designs can have common mode voltages in excess of hundreds or even thousands of volts and maintain the need to see small differential signals, this common mode error can be even more severe. At 1,000 V common mode voltage, the error due to a CMRR of 20 dB would be 100 V.
A probe’s CMRR specification is typically called out on a data sheet. 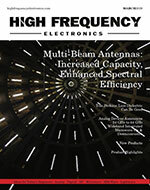 Usually, the data sheet will boast a specification that is well beyond the usable value of 80 dB (10,000:1). Upon further examination of the data sheet, the numbers beyond the headline are less impressive. For example, the LeCroy DA1855AA amplifier which has long been considered best in class for power measurements calls out a CMRR value of 100,000:1. This CMRR value is true for DC, but even at 70 Hz, the specified CMRR value drops in half to 50,000:1. 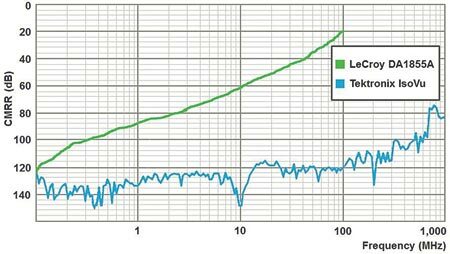 At the full bandwidth of the amplifier, the CMRR is only 20 dB or 10:1. When comparing a product’s CMRR value to your measurement requirements, it’s important to remember to match the edge rates of critical measurements to the measurement system’s corresponding CMRR value. This corresponding value can be easily determined by examining the CMRR versus frequency plot typically found in the product’s user manual. An example of this kind of derating curve is found in Figure 2 which compares the LeCroy DA1855A to the IsoVu measurement system. Figure 2 • Probe CMRR derating over frequency. IsoVu maintains a high CMRR over its entire operating range due to its complete galvanic isolation, and at 100 MHz, IsoVu’s CMRR value is 1,000,000:1 (120 dB). 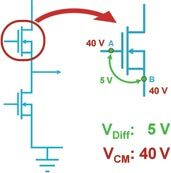 Recalling the 5 ns edge rate of the circuit referenced in Figure 1, the common mode error using a measurement system with 10:1 CMRR was 4 V. By comparison, the common mode error with IsoVu’s 1 Million to 1 CMRR is 40 µV. IsoVu’s high CMRR over bandwidth makes measurements of small differential voltages in the presence of common mode interference possible. A differential probe’s data sheet will include input voltage ratings with some products specifying a common mode voltage range in the thousands of volts. However, you should be aware that the listed specification is generally true only at DC and low frequencies. As is the case with CMRR, voltage ratings also derate over frequency, severely limiting the common mode voltage capability at higher frequencies. An example of this voltage derating is the plot of Keysight’s N2790A 200 MHz high voltage differential probe shown in Figure 3. Although the voltage rating of the probe is1 kVrms at DC and low frequencies, the probe’s capabilities start to roll off at 2 MHz and this probe is only capable of a few Volts at full bandwidth. By contrast, a solution with complete galvanic isolation can withstand common mode voltages of >2,000 Vpeak across its frequency range without derating. However, with full galvanic isolation through a fiber optic connection, an optical probe’s only limitation in its common mode voltage rating is based on safety certification standards. As shown in Figure 3, the derating curve for the IsoVu system is a flat line meaning the product’s voltage rating does not derate over frequency. Figure 3 • Voltage derating over frequency. 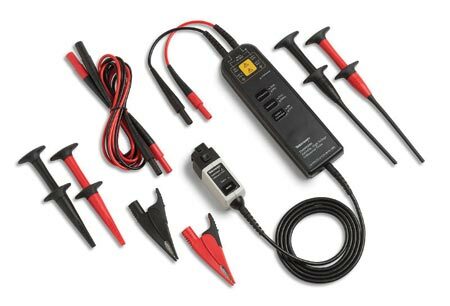 Traditional high voltage differential probes such as the one shown in Figure 4 have long input leads. While the long input leads are convenient for accessing test points, they are susceptible to picking up radiated emissions and noise from surrounding circuitry. Any mismatch in how the radiated emissions are coupled onto the leads is going to result in measurement error. Even if it was possible to perfectly match the differential amplifier, attaching anything to the amplifier inputs in an uncontrolled environment which will degrade performance. Figure 4. • Traditional differential probe. In a typical application, a pair of probes are connected to the differential amplifier input. These probes are subject to differences in lead length, orientation, susceptibility, and loading which makes repeatable measurements impossible. Common techniques that attempt to address this lead length problem are to either twist the leads or to shorten them. While this might offer minimal improvement, it does not overcome the inherent problem. An ideal differential probe would be immune to differences in lead length, orientation, susceptibility, and loading. IsoVu’s unique architecture eliminates the need for matched input leads by providing a true floating input with a shielded input structure. 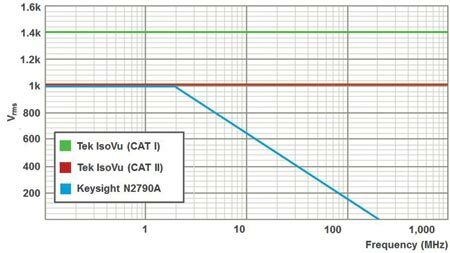 Accurate differential measurements rely on a combination of the measurement system’s performance, common mode voltage, and common mode rejection capability. Despite these requirements, advancements in test and measurement for power testing, EMI testing, ESD testing, and remote measurement capability have been minimal at best and have not kept pace with changing test requirements. Using a probe with galvanic isolation represents a leap forward in technology and offers a combination of high bandwidth, high common mode voltage, and high common mode rejection to enable challenging differential measurements. 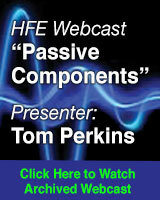 Tom Neville is a Product Planner and Product Marketing Manager in the Tektronix Time Domain Business Unit. He has an MSEE from Portland State University and a BS degree from the United States Military Academy. Tom has worked at Tektronix for the past 9 years with a focus on measurement solutions for power applications.